Downtown street cleaning takes place in the early morning between midnight and 7 a.m. and vehicles must be removed from streets scheduled for cleaning. Vehicles not removed will be ticketed. Scheduled downtown street cleaning began Tuesday, April 17 and continues until Friday, September 21, 2018. To check if your downtown street is included, use the street cleaning look-up on our website. 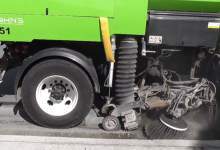 Outside the downtown, street cleaning is not scheduled and occurs during the daytime and evenings. Streets may not be cleaned on the scheduled dates due to parked cars, extreme weather or mechanical breakdowns. If this occurs, the next scheduled cleaning date is the next opportunity to clean the street. Unlike snow removal, the downtown street cleaning schedule is determined well in advance for the entire season. This mean you can look up the cleaning dates for your downtown street now, and mark these dates in your calendar. A new way to learn what streets are schedule for cleaning. All streets are listed and shown on a map, with a different colour to indicate if it's for both sides of the street, or just one (odd or even house numbers). Put in your street address and learn all the dates your street is scheduled for cleaning. Also, search by date to learn all the streets being cleaned so you know where not to park on a particular date. Call Access St. John’s at 311 or 709-754-CITY (2489) to earn the dates when your street is scheduled for cleaning or to request a paper copy of all downtown streets and scheduled dates for cleaning.